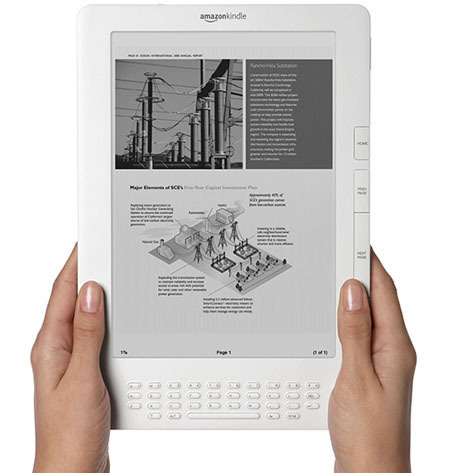 I’m not surprised about the recent news regarding Amazon and Kindle from FierceMobileContent - A pair of patent applications outline a “system and a method of incorporating advertisements in on-demand printed content.” In other words, advertisements inserted into books you’re reading on the Kindle. And because books can be read across a variety of platforms, it’s another revenue stream for the mobile industry as a whole. “Traditional” newspaper and magazine readers are already accustomed to advertising and feature stories side-by-side and the vast majority of on-line content is advertising supported. Maybe a book download without ads is the regular market price but a book with advertisements is much, much cheaper – reading becomes more affordable than ever. Mainstream popular books (Harry Potter perhaps) could even subsidize themselves by advertising products – such as merchandise, film DVDs, ring tones, etc. As location-based services become more mature, it would be interesting to tie contextual ads based on what you’re reading to your location – for example, if you’re in North Dakota in the middle of winter reading a book set on the beach, a warm weather vacation advertisement would be a fit. A biography about a famous comic could yield an advertisement (and a coupon) for a local comedy club. It will be interesting to see if this comes to fruition for other devices - particularly as Kindle content becomes available on devices beyond the Kindle – right now, it’s just available on the iPhone. Although some reading purists, might see this as a negative, I think if this is handled tastefully, the public will embrace more affordable books and an enhanced mobile user reading experience.